Environmental Protection Agency Administrator Scott Pruitt testifies before the Senate Environment Committee on Capitol Hill in Washington, Tuesday, Jan. 30, 2018. Newly obtained internal documents from the Environmental Protection Agency provide a behind-the-scenes look at the Scott Pruitt-led agency — offering evidence of private, high-level meetings at the Trump International Hotel in Washington and lavish dinners for top agency officials both at home and abroad, NBC News reported. 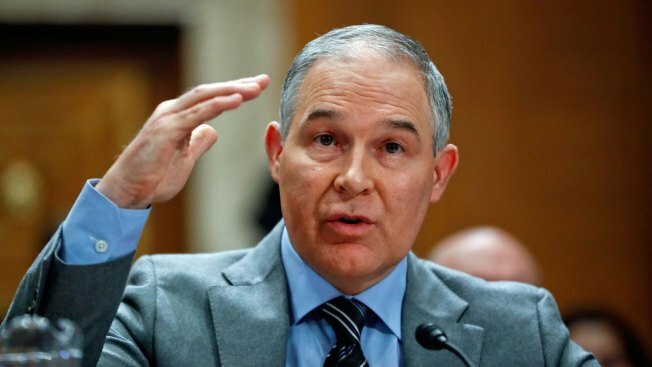 In one such instance — during a four-day trip to Italy for last year’s G-7 summit — Pruitt dined at the five-star, luxury Hotel Eden in Rome. That detail is included in the more than 10,000 pages of documents obtained through a Freedom of Information Act lawsuit by the Sierra Club. The Hotel Eden's fine dining restaurant, La Terrazza, offers a tasting menu for 280 Euros per person ($333.76, U.S.). A schedule indicates Pruitt's dining partners for the evening included his chief of staff, Ryan Jackson, and Samantha Dravis, his former senior counsel who resigned abruptly last month.